The Lake Access Project is a committee of the Trails for Creston Valley Society. Combining data from the RDCK and volunteer surveys we have put together this map to promote lake access and to help identify sites for upgrades. If you have any doubt about the location of any access point please visit the RDCK web map for the “Official” version of the data, including property boundaries and right-of-ways. This information was compiled by volunteers, and Trails for Creston Valley Society assumes no responsibility for errors. Many of the sites have no constructed trails and/or dangerous access only. Use of the these sites and this map is done at your own risk. Please help us keep these sites clean, by packing out any garbage you bring or find! 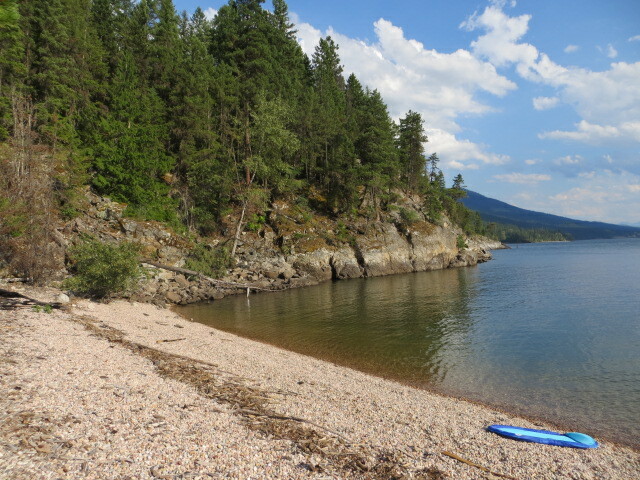 A visit to Kootenay Lake shoreline is a treat in all seasons for: walks, kayaking, fishing off the rocks, playing in the sand, swimming from shore, picnicking, wildlife viewing, photography, painting, contemplating and soaking up the surrounding beauty. There are several public lake access points besides searching for sections of Crown Land that we have made known here. Please use at your own risk and please help to keep clean and beautiful. 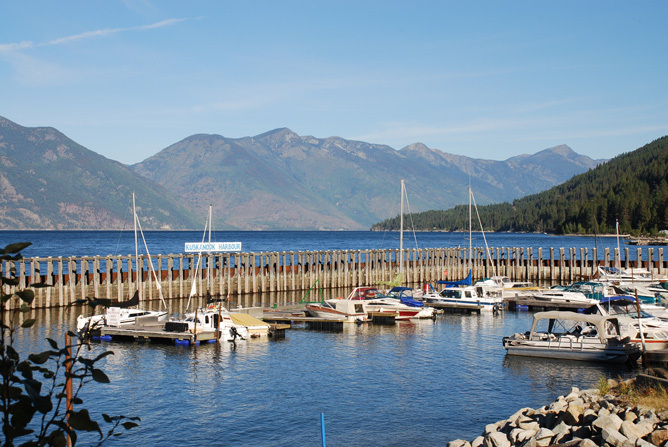 Kuskanook Rest Area and Boat Launch offers the closest fully serviced access to Kootenay Lake from Creston. Its more than just a boat launch however, as there is a beautiful beach on the south side well worth visiting. This is a beautiful pebble beach next to the Ferry Landing. It can accommodate many beach goers but few people use it. Perhaps because they have little time between ferries or because they might think it is a private beach. The bathrooms, picnic tables and garbage cans are located at the Ferry Landing loading zone. To see a map with property lines click here. The main site at Twin Bays has a beautiful beach with easy access for drop-off. 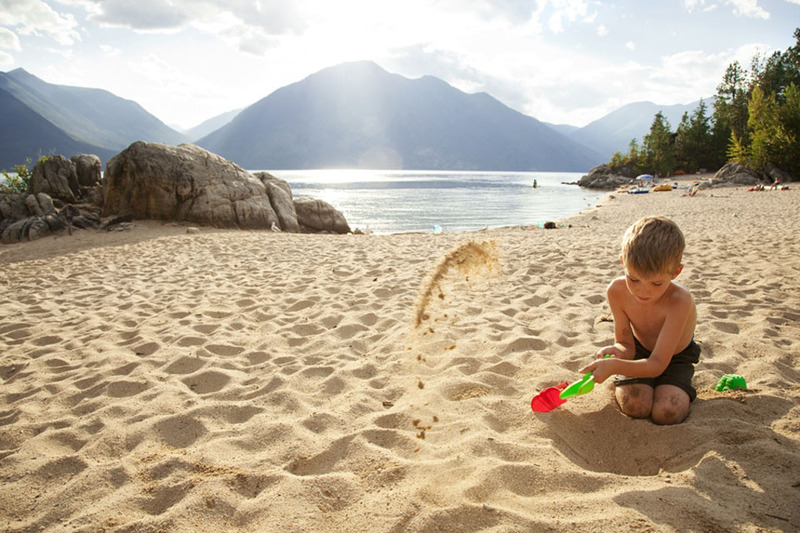 Its fine sandy beach makes it the most popular beach on the East Shore of Kootenay Lake. Parking is available down the road. At the parking lot is a bathroom and garbage pickup. This site is privately owned by Teck Cominco. They have granted public access to this site. 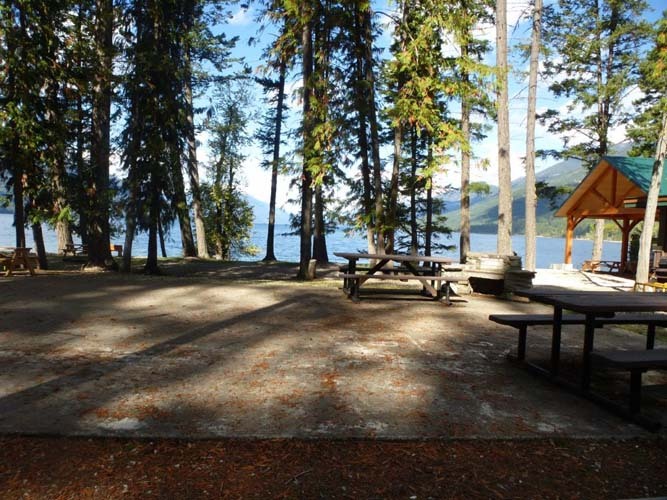 It has camping facilities, bathrooms, garbage pickup, covered picnic area and a beautiful beach with fabulous views of the lake and mountains. This is a Provincial Rec Site, with camping, outhouses, and plenty of lovely pebble beach. Its well worth the drive up the forest service road north from Riondel. The Kootenay Lake is the largest natural freshwater lake in BC. However, it is one of the least inhabited lakes in BC, likely because it is underdeveloped. It largely remains in its pure natural raw state. This characteristic is part of its charm for many people who live on the lake or visit the Kootenay Lake every summer. 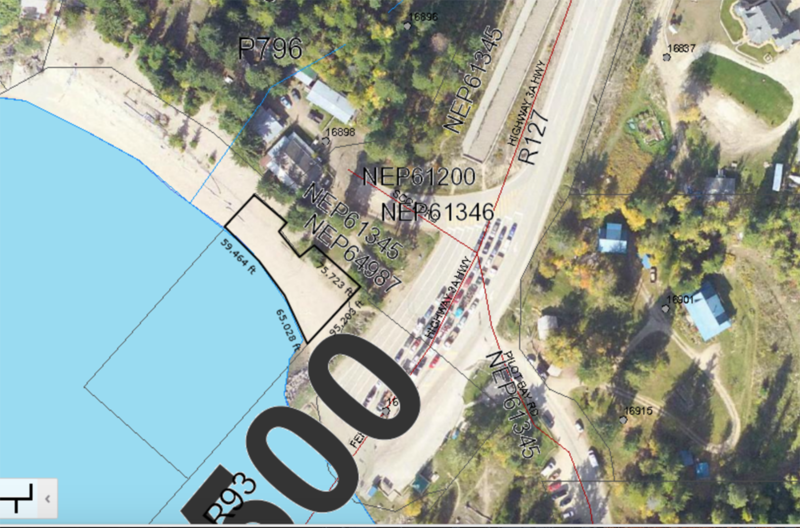 Highway 3A follows much of the Kootenay Lake east shore starting just before Kuskanook and ending at the Kootenay Ferry Landing at Kootenay Bay. The road also continues north of Kootenay Bay, to the town of Riondel, and a bit beyond. With every twist and turn (there are many) of the double lane road you will notice spectacular views of the lake. The trick is how do you get to the water. Much of the road passes by cliffs, trees and private residences. 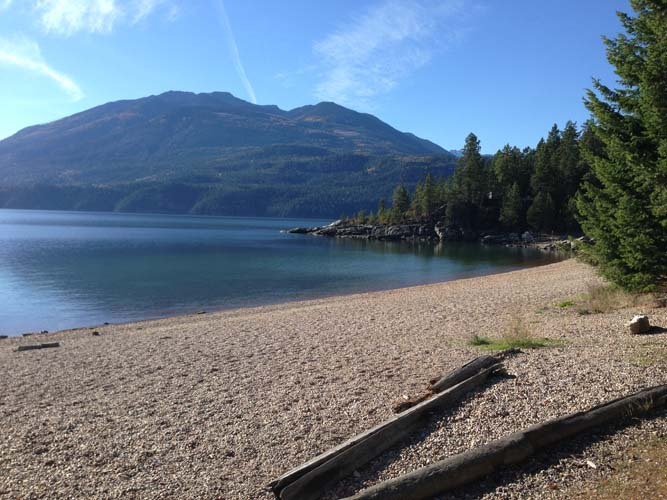 Presently, there is only one Provincial Park for vehicle camping on this side of the Kootenay Lake and a couple community parks. 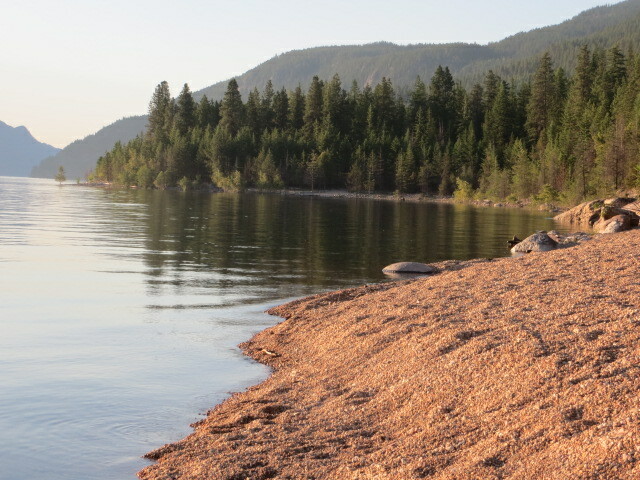 The camping Provincial Park is Lockhart Beach and Camp Ground. There is a camping rec site located beyond Riondel called Garland Bay. There is also a beach campground at Riondel that is run by a non-profit society. A lovely Provincial Marine Park is located at Pilot Point near the Kootenay Ferry Landing. You can also find a few business campgrounds that make the lake more accessible. There is also crown land (public access) along the lake but it is difficult to differentiate what is crown land and what is private land from the roadside. Identifying crown land can be done by visiting http://www.rdck.ca/EN/main/services/mapping-gis.html . Fortunately, there are public lake access points along the lake that are accessible to most people but not for people who are mobility challenged. Most of these sites have not been developed and are not easy to spot from the highway. They have rugged shoreline access trails, no bathrooms or garbage cans. Please make note of where the closest bathroom is to the beach you select. People who visit these sites are encouraged to also help take care of them by packing out garbage. Please plan to bring along a garbage bag just in case there is garbage when you arrive. Nature and fellow users will be happy you helped out. Each site has its own unique and special qualities. Some are also good for fishing from the shoreline.